I am contesting the upcoming Lok Sabha elections which is to be held on 23rd April 2019 from the Idukki constituency. In the current political scenario, we realise more and more the significance of Dr B R Ambedkar’s political vision that until and unless the ex-untouchables get political power, the exclusion enforced on them will continue. He considered political power as a key to all social progress, the relevance of which needs to be reiterated again and again. In this so-called ‘modern democracy’, Dalit-Adivasis are being assaulted and murdered in the name of caste, cow, love, colour and race. Muslims are being humiliated and killed in the name of beef and are being branded as threat to society. Dalit youth are being denied opportunities in higher education and even when they get through they are being harassed. The BJP, the Congress, and the Left are united in their attempts to undermine the system of reservation, and thus to decimate the representation and the rights of the marginalized people. The Scheduled Castes and Scheduled Tribes (Prevention of Atrocities) Act has already been weakened – all these point to the reality that even after seven decades of independence, we continue to live within a power structure where the marginalized people of India are denied fundamental justice. The nationwide attempts of the Hindutva fascist forces to organise violence and communal riots, to marginalise minorities and to create communal polarization are gaining momentum. They are using the entire State mechanism to achieve their goals. Even though the Constitution and the political democracy in general were envisioned and designed with the aim of bringing the oppressed masses into the realm of socio-political power, the social classes and communities which held hegemonic power in the traditional caste society could manage to extend their authority over the political structure of the democratic system. The marginalized classes have seen their slavery taking the form of political slavery under this modernised Brahmanical system and rule. The large mass of people including Adivasis, Dalits, Plantation and Agricultural workers, Dalit-Christians, Fishermen, Women, Transgenders, the Backward Classes, Muslims and other Religious Minorities, and Linguistic Minorities can never build for themselves a just social order unless their representation in the political scenario is ensured. In spite of India and Kerala having become democratic in governance, plantation-rich areas like Munnar continue to be under the burden of colonial laws and relations of power. The Plantation Labour Act, which does not even recognize a plantation worker as a citizen and gives the managements unrestrained authority, is in force even today. It should be noted that the Plantation Labour Act 1951 comprises of laws that were formed to ensure the common minimum of rights allowed to slaves by the British during the colonial rule. According to the Act, the responsibility of ensuring these rights lies with the management of the plantation; and not with the democratically elected governments. These laws, which are older than the formation of the state of Kerala, form the ground on which all kinds of abuse of power and denial of democratic rights are being carried out in the plantation sector. Without amending this Act in favour of the labourers, there would be no assistance from the government and hence, no solution to the problems related to wages, bonuses, job security, workplace rights, civic rights and so on faced by the workers. The plantation workers who work for 10-12 hours every day receive daily wages of just 301-325 rupees. The legendary Pombillai Orumai struggle of 2015 had succeeded in getting approval for higher wages, but the approved reforms are yet to be implemented. The Leftist government of Kerala has shown its betrayal of the working class cause in this issue. While the manual labourers working in other sectors in Kerala receive wages in the range of 700-800 rupees, the plantation workers have to settle for a nominal payment in return for their long and hard working hours. The managements in the plantation sector are keeping the workers confined to their caste occupation by denying them the wages they deserve. The government, the prominent political parties, and the trade unions stand in favour of the managements in this issue. The government should take steps to ensure that the workers are paid at least 600 rupees for a day of work. The major crisis faced by the plantation workers is that they do not own a house or a strip of land. When they retire from their job at the plantation, they are expected to vacate their quarters. Many of them do not have a shelter to go after retirement. To avoid this, they are compelled to send even their highly educated children for plantation work, so that they can retain their quarters. Even though 4000 families have received the necessary documents to get a title-deed and 518 have already received title-deeds in 2009, none of them know where their lands are located. Land has been given only to a small number of people. The government is attempting to move them from their single-room, slum-like quarters to similarly cramped 350 square feet apartments, which do not improve their conditions; in fact, the government is denying the workers’ demand for land and houses through this. Land grabbing mafias like Tatas and Harrisons have illegally claimed nearly 5.25 lakh acres of land which belong to the State. Plantation monopolies such as Tatas and Harrisons are being protected by the Left government in Kerala. The government must introduce proper legislation and recover the illegally occupied land. The land thus recovered must be used for rehabilitating plantation workers, Adivasis, Dalits and other landless and backward classes. Not even 10% of the unauthorized land held by these monopolies would be needed to successfully rehabilitate these people and to give them the ownership of land. The reformation of plantations is also crucial to retain the ecological balance of Kerala. The Idukki district has suffered great losses in the flood. Numerous farmers lost their land, houses and means of subsistence. Unable to overcome the tragedy, many of them are being driven towards suicide. The government must formulate a special scheme to help the farmers to survive this situation. The government needs to implement the ESI scheme for the plantation workers, ensure job security, set up special schools and colleges for their children and provide them with adequate hostel facilities so that they would not be forced to live in their inadequate quarters during their education and provide state-owned hospital services with modern facilities. These are a few among my demands as I contest this election. In this fight for justice, I request the support of all sections of people, the various political organizations, and the social and cultural movements. To make social democracy a reality, to uphold the political demands of the oppressed classes in the parliament, I request you to elect me as your representative from the parliamentary constituency of Idukki. This letter was translated into English by Arjun and originally published in Round Table India. 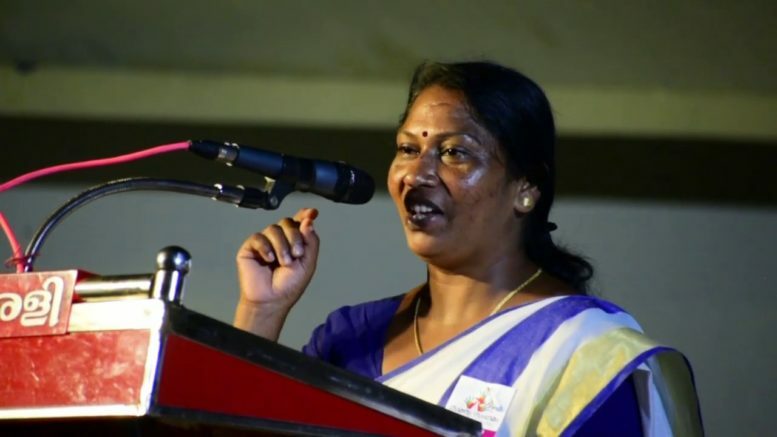 Be the first to comment on "To uphold political demands of oppressed in parliament, elect me as your representative: G Gomathi"